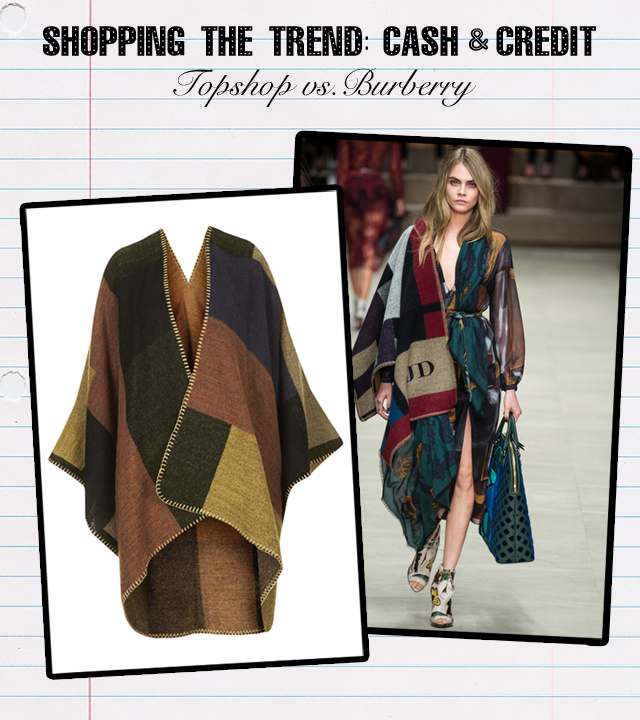 If you're looking at trends for autumn winter, you can't escape the fact that the cape/poncho is back and bigger than ever, quite literally. Burberry ended their show with each and every model taking to the catwalk wearing a personalised Blanket poncho. Ever since that moment fateful fashion moment, the retail world has been buzzing trying to get the trend out there on shelves as fast as their production teams can make it happen. Trust me, you'll be seeing this trend everywhere. Burberry's personalised blanket poncho is above and beyond perfection. So if you are looking for an investment, buy into the brand that started it all. The Burberry Poncho is £895 and comes with the added element of a personal touch. You'll keep this one in the "for eternity" closet. However, if you're looking for a quick and easy piece to channel the trend and then move on, consider Topshop's option for the season. The Topshop colour block cape is £32 and ready to grab right now, on the shelves as we speak. Whatever way you choose to go, wear it with pride and make it your own. Mine's being thrown over double denim and big ole boots. No surprise there.